This is the last step in your training to become a certified Full Cave Diver. 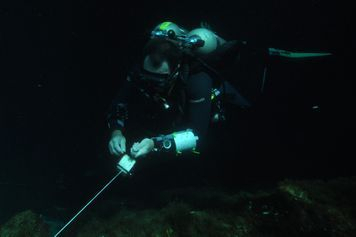 During this course, you are exposed to more sophisticated cave diving scenarios in more complex cave environments. Techniques during the previous levels of training are further refined and complex navigation skills are emphasized. The primary focus of the Full Cave Diver course is to establish proper procedures for completing traverses and circuits, both simple and complex. In the scenarios presented, you are responsible for dive planning, gas management, and dive execution. The Full Cave Diver course requires a minimum of 2 to 3 full days. ** The Rule of Thirds is the guideline established for maximum penetration. Additional equipment is required for this level of training including dual cylinders with a minimum volume of 142 cf, dual outlet manifold with isolator bar, gap reel, and primary light. Please review the equipment section for further discussion of dive gear with your instructor. Remember, that no matter the level of overhead training, if a diver is not properly configured for a cavern or cave dive, s/he is diving as an open water diver and should never enter the overhead environment. Please contact us if you would like to receive more information about the Full Cave Diver Course or to make a reservation. The traditional approach for cave diver certification is broken down into a series of courses which can be taken in a 2 or 3 day period. However, as circumstances have changed and divers come from great distances and different countries with the goal of becoming a full certified cave diver we can also offer the modern approach which allows a qualified diver to become a Full Cave Diver in one step involving a 7 day intensive program. If you wish to go along the modern approach it is important to understand that this program is highly rigorous and demanding—both physically and mentally. Specifics of the continuous seven-day Cavern-through-Full Cave program must be discussed prior to scheduling this series of courses.